Diwali is around the corner. Though there has been a great change in Diwali-Celebration-Scheme "(Crackers and get-together etc which have almost vanished ) since 2000's :D yet craze to stylize and be unique is till omnipresent... and is same for me.. Earlier, almost 1 month prior to Diwali, I used to start searching for something simple yet stylish and always used to end up buying lehengas or sarees ( yes, I love saree soo much). But this time i literally promised myself that, I wont be wasting much time on dress-hunt, plus I wont be wearing those basics and would definitely try something simple yet different, no matter what. 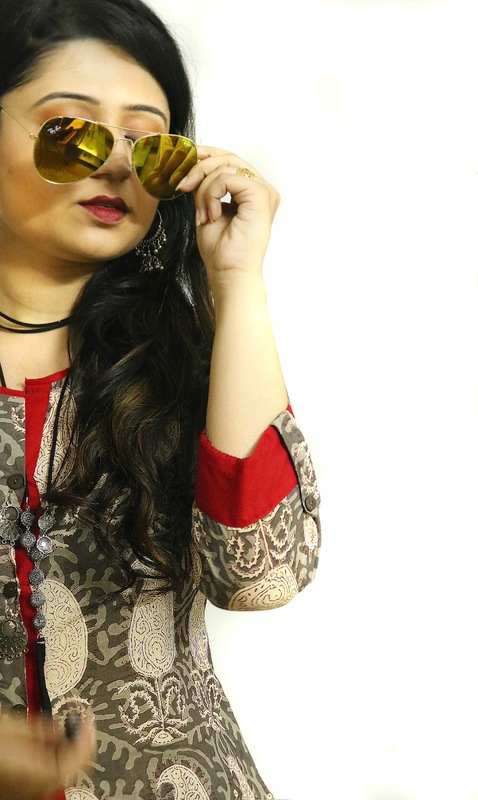 And to my surprise, yesterday only whilst roaming in Lajpat Nagar i found this super cute boho kurta and the moment I saw it I knew, it would be going in my closet . 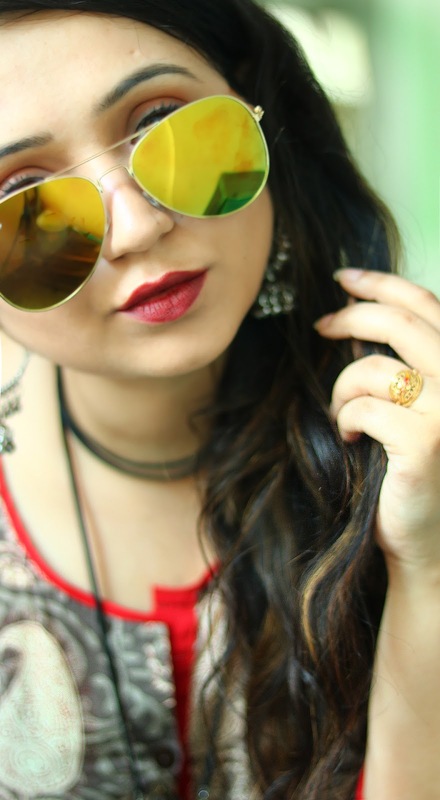 I have a thing for Boho and Hippy styles. They kind of give me a very laid back and relaxed feelings. 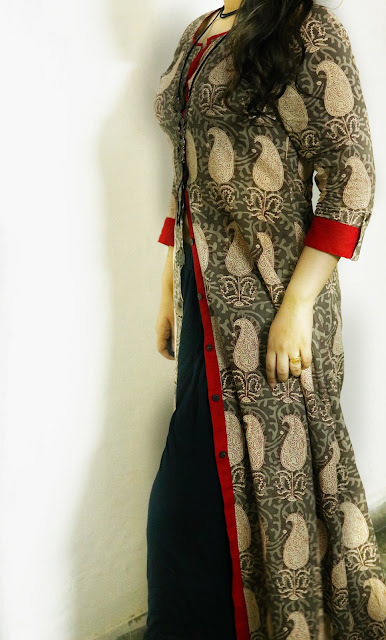 A very boho-autumny kind of front open kurta that has certain style of petals allover ( I think this type of design has some name, but poor me, who is very bad at remembering names, so sorry :D) . Allover prints were again in style this year, all over instagram and tumblr accounts. 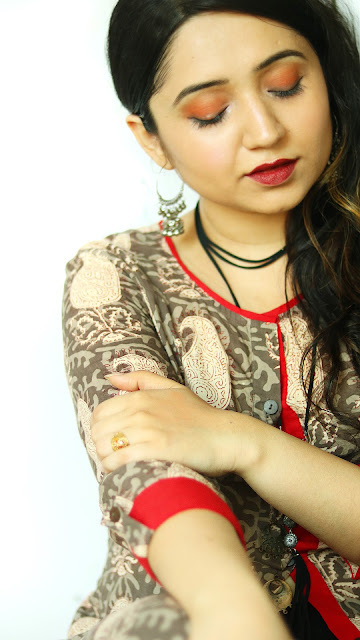 So I went for this kurta. It was front-open with cutest buttons on earth. I kept lower lower portion opened , for a shrug look. The red borders very smartly accentuating the whole look of the kurta gave it a retro vibe and antique silver button hangings made it more boho and ethnic. If you do not know I am short height-ed (Not that short :D but still proud ), so paired it with black heels from H n M.
Black Afgani pants are from Melange, which are so comfy that i cannot even tell. To spice it up a little bit i added this choker from Forever 21 (Favourite store ever ♥). Its embellishments literally matched with the attachments of buttons (I dont know what to call them). Adding a choker can be little tricky sometimes, but usually round necks do well with 'em. 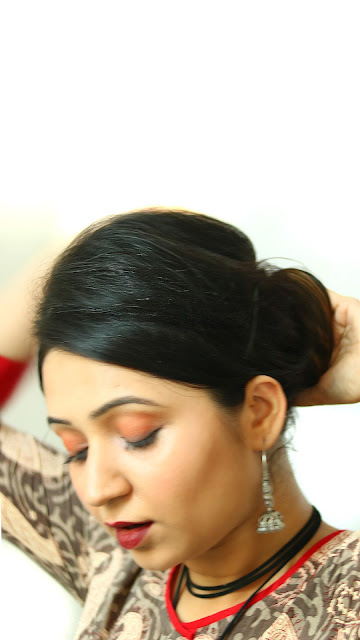 For the makeup part, as its not that autumn-ish here in delhi yet, so I kept it simple. I used, little bit of foundation from Maybelline, Brick-red eye shadow from Inglot, Bronzer from Nyx, Mascara from Maybelline and last but not the least, the very authentic SIN from Mac and voila, i was done. And as a piece of suggestion, no better place to buy earings, than Sarojini Nagar. This silver piece literally costed me nothing yet literally is gleaming up the whole look. I am not sure if you can find exact similar kurta in Lajpatpat Nagar, but you can find something-like this for sure. 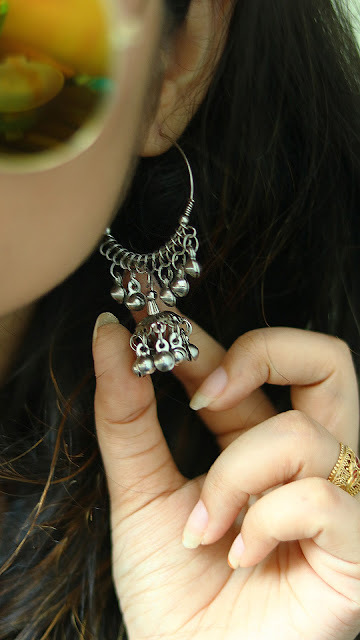 Adding some itsy bitsy pieces to your simple outfit can make it look quite interesting and ostentatious. What are your plans for this Diwali ?